DigiLabs Pro would like to introduce its newest Feature for online orders. This new shipping method is the easier and more accurate alternative to our old shipping method. 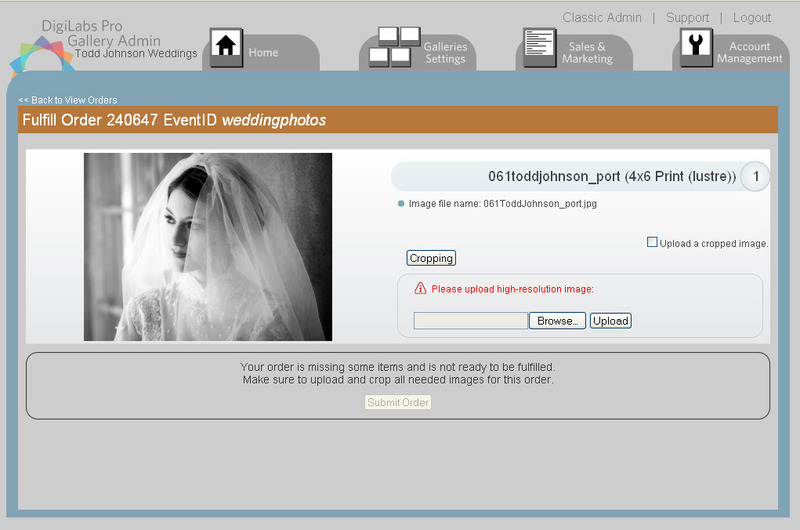 It allows clients to take the shipping off the photographers hands. All the client needs to do is to type in their address and our new shipping feature does the rest. In a matter of seconds, the automated shipping will generate the cost of delivery. And yes, It can even calculate international shipping rates. This entry was posted in Online Web Gallery Fulfillment and tagged DigiLabs Pro, professional photography tools, shipping tools, web gallery tools on November 28, 2011 by DigiLabs Pro Blogger. Now you are inside the order fulfillment system. 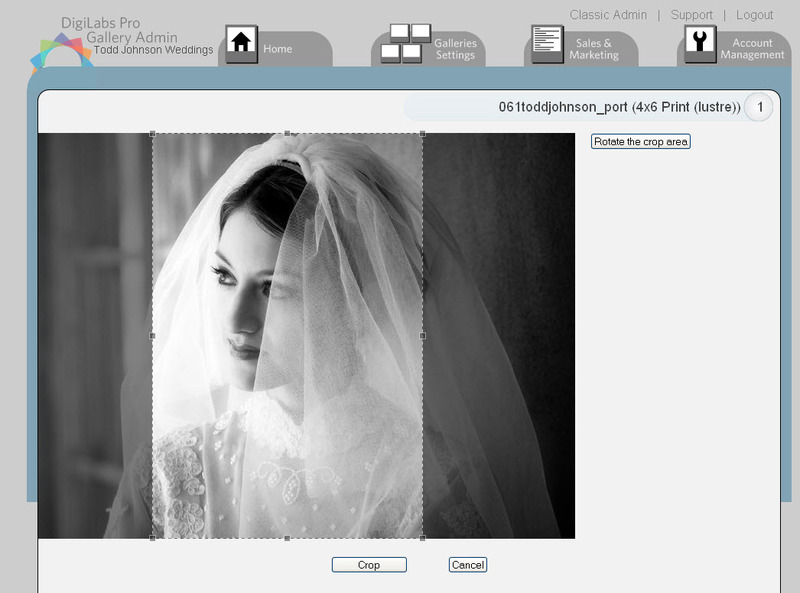 Upload a high res version of your image (for optimal printing) and adjust cropping using the online cropping tool. Want to crop the image yourself? Simply check the “Upload a cropped image” box and upload your image and you are all done! Push “Submit Order” and your order will instantly head to the lab and begin the printing process. Yes, it is that fast! You will then be back at the “View Orders” screen and your order will be marked as fulfilled. Can I just use the image file you have in the gallery and NOT upload a new image? To make sure that your customers get the best image possible, we require you to upload the image in high res. This is to make sure your images look their best and it is to your advantage. I uploaded an image, but I am not sure if it is the right one. How can I make sure it is correct? I don’t want to use the image I uploaded for this order. Can I change it? How do I crop the image? Simply select the “Cropping” button on the main page. Once selected, you can adjust the lines to the proper placement. 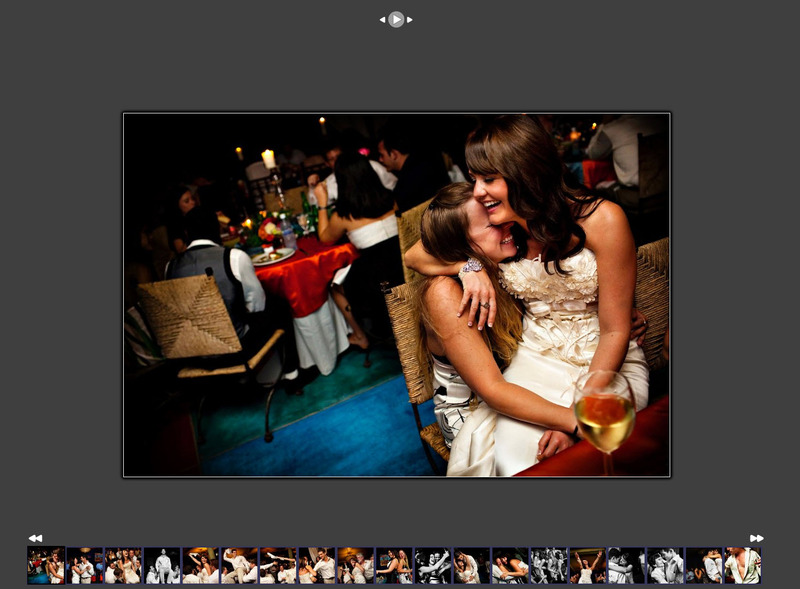 Click the “Rotate the Crop Area” button to move it from landscape to portrait as needed. Note: we will keep the proper aspect ratio for the image size selected. Once you are done push “crop” and you will be redirected back to the previous screen. The preview will show your new cropped image. I don’t want to use your crop tool. I want to do it myself. How do I make sure you don’t crop my image for me? Simply push the “Upload Cropped Image” box and all of your cropping selections will be gone. Simply upload your image and we will use that to print your image. Assuming the image is cropped correctly, you will get the image you sent us. I just got many orders of the same image. Do I have to upload the image for every one of these orders? Maybe. If you uploaded an image and had the “Upload Cropped Image” box selected, you will have to upload a new file for every order of that image. If you used our online cropping system (which we recommend), you will not have to upload the file again. Once it is in our system, we are all set. Not need to upload the same image multiple times. But, if they are different aspect ratios (i.e. 4×6 v. 8×10) you will have to review and approve the crop on each image. 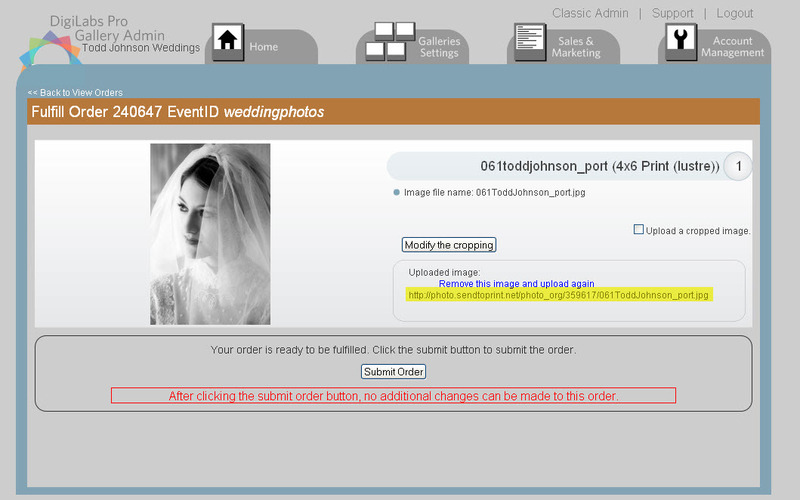 I don’t want you to use the same file to fulfill all the other orders with that image. I want to retouch it based on each order. That can be done. Simply select the “Upload Cropped Image” box before you upload your image (make sure it is cropped correctly) and we will not use that file when someone orders that same image. Can I fulfill an order with multiple images using this tool? Yes! You just need to upload and crop each image and the order will be fulfilled. I really like the FTP or CD process. Can I keep doing this? Yes. We have no plans to turn these off right now. I don’t have the fulfill online button. What happened? Make sure your account is set up properly. Make sure you are using our new web galleries and that your account is set up to have DigiLabs Pro fulfill all your orders. Still not working? Make sure you have pricelists set up correctly using DigiLabs Pro products. Still having a problem? Contact our support team at support@digilabspro.com and they will make sure you get up and running in no time. I don’t use you for Web Galleries but I want to learn more. Where can I find out more? You can always visit us on our website or contact us via email support@digilabspro.com or via phone at 866-344-4522 ext 126. We will be happy to help and show you our Web Galleries. This entry was posted in Online Web Gallery Fulfillment and tagged Digilabs, professional photography, professional web galleries on November 1, 2011 by DigiLabs Pro Blogger. Simply sign in to your DigiLabs Pro account (or sign up for a new account) + update your software. What are the different galleries called? Classic – Our historical galleries. Pro – Our new and improved web galleries. In order to use our pro galleries, you need to make sure you have the most updated version of our software and use this special link. We did a complete redesign of your storefront and back office. This includes design and technology. So, you will see all sorts of great new features and advancements – take a look. Can I see a sample gallery? Absolutely! 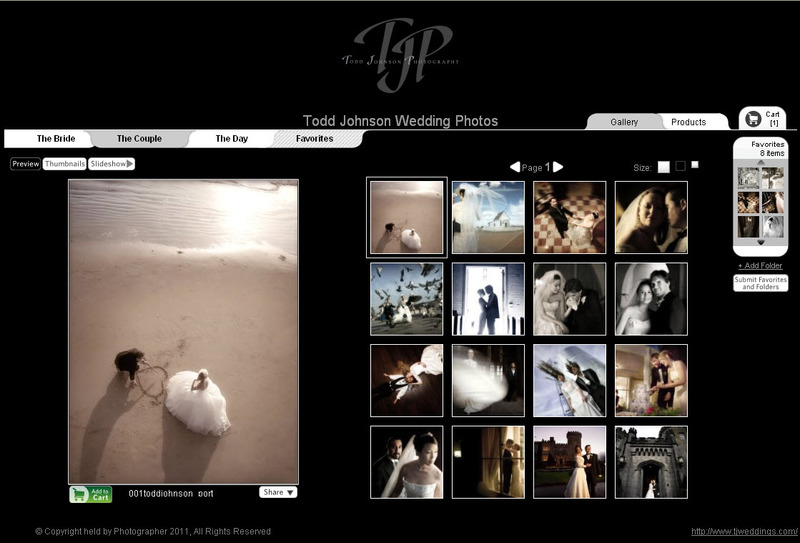 Take a look at our demo gallery but we highly encourage you to login and create new galleries to see how it all works. What web browsers work the best with the new galleries? My back office looks different. Why? In order to support the new system, we had to update the back office and did some much needed design improvements. You should find things a little easier with our new categorization & there is an improvement in overall load time. Can I use the old back office? Yes. We currently allow you to toggle between the two. Simply sign in to your account and click “Classic” on the top right of your screen. This will bring you to the old back office. We are allowing this for a limited time, so if you think something is missing, let us know by emailing support@digilabspro.com. Will my current galleries automatically convert to the new layout? No. Because we have many different sized images, the old galleries cannot convert the Classic Galleries to Pro Galleries automatically. If you would like to change a current Classic Gallery to a Pro Gallery, simply upload a new gallery within our software (the software will ask you which style you would prefer). This will upgrade your gallery from Classic to Pro. IMPORTANT: Please make sure you have the most updated version of our software (see above on instructions on how to update your software). Can I keep using the Classic Galleries? Yes. We will allow you to utilize both the Classic and Pro Galleries. Eventually we will switch everyone to the new web galleries, so get started now. When uploading the gallery in the software, you will have the option to choose which gallery you would like to use. What about my portal page? In the admin area, you will find the links to the new and old portal page designs. 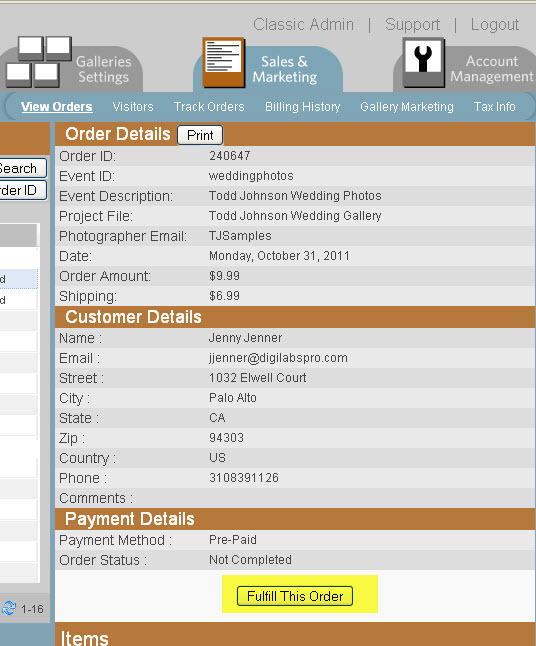 Both will work for either galleries, but the pro version portal pages offer more design options. If you point to the portal pages from your web site, you will need to change the links on your site to point to the new portal pages. What about the gallery login page on my site? Will I need to change anything? No. When logging into a gallery, regardless if this done from the default login page or a page you host on your site, we will automatically identify the gallery type (Classic or Pro) and will display the right gallery type. You do not need to change anything. How many categories can I have in each event? You can have unlimited number of categories. Visible categories depend on the width of a customers screen. The categories not shown are consolidated within a scrollable drop down menu. I use PayPal for charging. Can I use PayPal in this new design? Unfortunately we will no longer be supporting PayPal. If you need help selecting another provider, or would like to look into using DigiLabs Pro for your charging, send an email to sales@digilabspro.com or give us a call at 1-866-344-4522. I uploaded my gallery but my logo isn’t appearing. Help! Not a problem. Since the gallery layout is different, we require that you upload a new logo for our Web Gallery Pro. You can use the same logo as the Classic or you can choose to layout your logo differently. If you don’t wish to change your logo, simply upload your current logo, and you will be all set. I don’t like the image I used on my gallery cover. Can I change it? Just like our Web Gallery Classic, this is defined within the software. Simply go back into the software and open the project. Click “Upload Gallery” and click through the wizard until you get to the “Gallery Entry Page” section (step 3). Here you can change your cover image to any of the photos in your gallery. This is great. What’s next? We are working on updating the system and will probably be working on a few fixes in the short term. The team is already working on the list for V2 of Pro Galleries. I have some questions and/or I want to provide you some feedback. Who do I contact? As you know, we want to make sure you have a great experience with us and we are here to support you during this transition. If you have any questions or concerns, you can contact us at support@digilabspro.com. This entry was posted in Online Web Gallery Fulfillment and tagged photographer web galleries, Photography, Web Galleries on June 20, 2011 by DigiLabs Pro Blogger. Simply sign in using this special link + update your software. This entry was posted in Online Web Gallery Fulfillment and tagged DigilabsPro, professional photography, Web Galleries on June 6, 2011 by DigiLabs Pro Blogger. During the months of November and December we let all of our web gallery customers re-post their older events/ galleries for free! So, what does this mean for you? As your silent business partner we, we’re here to help this holiday season! If you use our e-commerce web galleries you can re-post any of your events (visible on your administration area) for FREE. Don’t worry if your plan has image quota restrictions because we won’t be counting. If you don’t currently use our e-commerce web services yet here’s another reason to get started with a 30 day free trial. Have you have ever wondered why DigiLabs Pro keeps your inactive galleries in your “View Galleries” page in the Admin Tool? Galleries listed as FALSE in your “View Galleries” area do not count towards your image quota. We keep them there for the entire year, then give you the opportunity to re-post them over the holiday season. Repeat the steps above to activate the other galleries…and you’re all set. Sign in to your account and click on Discounts & Credits” (if you haven’t checked out this tool, WELCOME! 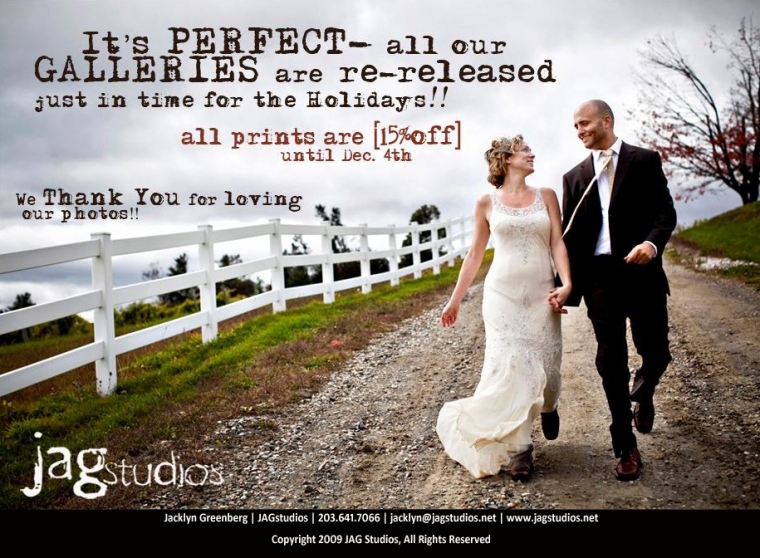 This an amazing marketing tool for your galleries…). You’ll notice, under the “Gallery” area, that you can create a global discount for ALL galleries OR select a particular Event ID. Select one. 3. Select an expiration date for your promotion. Marketing Tip: To create an urgency limit your promo to a short time frame (1 week period, etc). 4. If you would like, you can create a coupon code. This will limit the discount only to those who check out using the coupon provided. 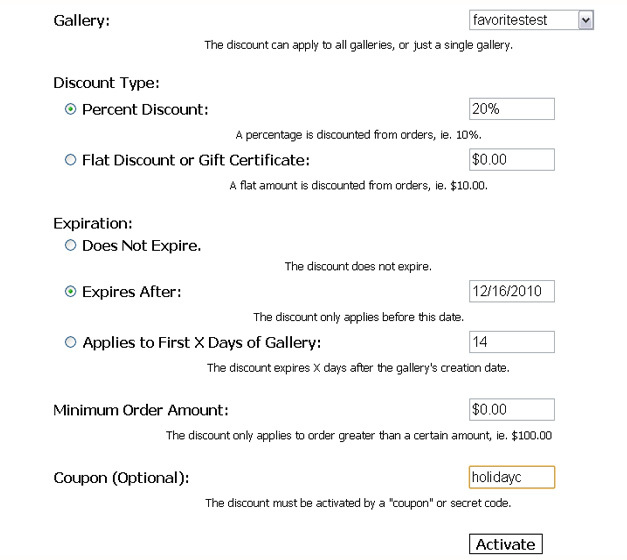 If you don’t add a coupon code, the discount will automatically appear in a customers cart (if they qualify) and the promo will appear in the gallery above the price list. The final step is spreading the news. First you’ll need to build your mailing list. To get all visitors that have visited your galleries this year, go to your administration and click on “Gallery Marketing”. 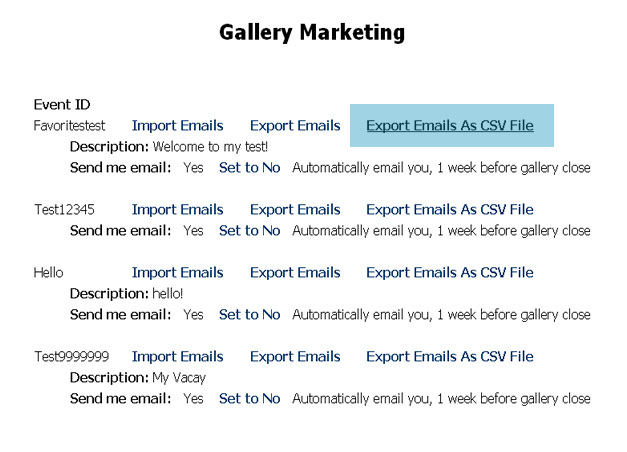 If you have activated this for your galleries, you can export all email addresses of people who visited a gallery. Feel free to add other relevant folks to these lists. Once you have your mailing list, create an effective email. If you don’t already have an email service we highly suggest singing up for your Studio. Check out Vertical Response or Mad Mimi. Check out some sample emails from Jag Studios and Studio EMP. subject: ‘Tis the Season for Prints & Wraps! In the great spirit of the holiday season YOUR STUDIO NAME is offering a special holiday discount for EVENT DESCRIPTION! 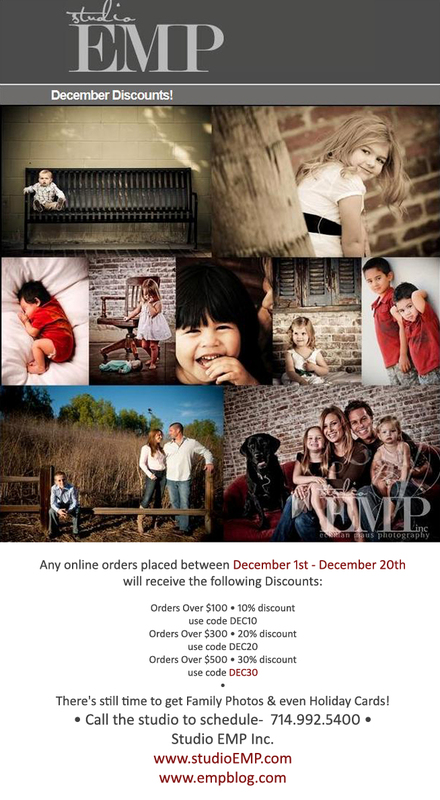 Get 20% off all online orders placed from November 23rd to December 3rd! Treat your friends and family to memories that will last a lifetime by giving them high quality prints and one of a kind gallery wraps. Take a peek and don’t miss out on our holiday savings. Shop now (direct link to gallery) and take care of all your holiday shopping! We love to hear other success stories, so feel free to post your ideas in the comments area below. If we like the idea we will post it on our social networks or in a future blog post, and we will credit your studio. Our goal here at Digilabs Pro is to make things easy so you can spend more time doing what you love… So let us know if there is anything we can help you with. This entry was posted in Online Web Gallery Fulfillment and tagged photo web gallery, photographer web galleries, professional photography on October 27, 2010 by DigiLabs Pro Blogger.